Alice is Energy Pilates & Fitness’s “Power house” and if you don’t know what that means – take one of her classes. She teaches incredibly challenging classes, but like ALL Energy instructors, she offers modifications for every exercise – both up and down the difficulty scale. And remember every class at Energy is multi level; they are suitable for all fitness levels. As soon as Alice starts teaching her class, you will know she loves what she is doing. That’s because movement has always been in her life and she has always has loved it. Starting at the age of 3 Alice was dancing; and probably if you ask her mother, she will tell you Alice was kicking up a storm in the womb and she still does. Fitness is Alice’s passion. It began with dance until she was 17; then in high school she participated in swimming & diving, gymnastics and track in high school. As an adult, she found her love of group fitness more than a decade ago and hasn't stopped since! 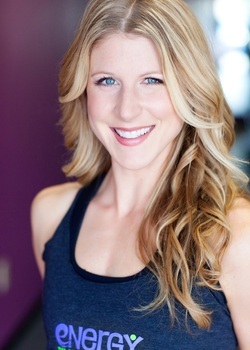 She loves the motivation, positive energy and camaraderie in group fitness classes. Alice loves to inspire people and has been teaching group fitness in various formats including strength, high-intensity cardio, step, and cycle for nearly 3 years. She also enjoys running and completed her first marathon last year! As a mother of two young children, Alice knows how important it is to make time for "YOU" and treat your body with respect and kindness. She is constantly amazed at the benefits of exercise for both the body and the mind. Energy is very excited to have Alice on our team! Alice believes laughter is the best medicine (aside from exercise of course! ), in getting her "fix" from watching clips of SNL and that peanut butter and chocolate are their own food groups.